We’ve had inexperienced and irresponsible presidents before. We’ve had populists and people who weren’t regarded as remotely the best and the brightest. We’ve been always saved by some combination of character and honesty and, above all, a respect for our history. But the man who currently lives in the house of John Adams, Teddy Roosevelt, and Harry Truman has never read a book on any of his predecessors. There are seventh graders who could answer that question. 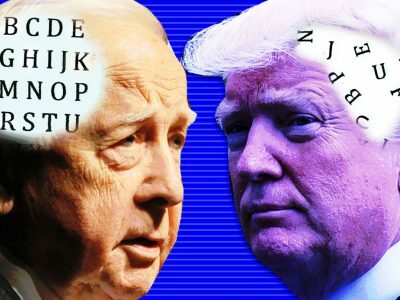 On the other side of the civic spectrum is David McCullough, America’s most beloved historian and surrogate grandfather figure. He’s back with a slender but substantive collection of speeches, reminding us that none of this is normal. The American Spirit: Who We Are and What We Stand For throws serious shade at President Trump. The speeches are largely college commencements from the 1990s and 2000s, so McCullough couldn’t have imagined a Trump presidency at the time. But it’s impossible to imagine that McCullough didn’t have Trump in mind when he was compiling this book, ruefully shaking his head, a sense of urgency born of the absurdity. And his considered wisdom reads like a vicious diss. For example: “How can we profess to love our country and take no interest in its history?” Good question. Ask the president. In contrast, President Trump seems to be trying to murder the English language by depriving it of meaning. He reflexively lies about big things and small, elevating his emotional truth at any given moment over fidelity to actual facts. Interview transcripts show a mind incapable of complete thoughts or even complete sentences without being distracted by self-congratulation. His Twitter tirades are schoolyard bully insults backed by nuclear launch codes. And his efforts to label any critical coverage “fake news” is an Orwellian attempt to blur the basic line between truth and lies. Of course, the ‘piling up of things’ is basically Trump’s reason for being. A lifelong proselytizer of the gospel of greed, the man actually increased the initiation fee to his Mar-a-Lago and Bedminster resorts after winning the presidency so he could profit from the honor of the Oval Office. To paraphrase Winston Wolf from Pulp Fiction, just ’cause Donald Trump is a character doesn’t mean he has character. And the recent revelation that Trump might just be taping White House conversations shows that just as character is destiny, history has a funny way of repeating if you refuse to learn its lessons. The final phrase—“May none but honest and wise men ever rule under this roof”—is etched in the mantelpiece of the State Dining Room of the White House. It now reads as brutal rebuke of this president from his predecessors. And that should be a source of sadness for anyone who loves our country. So what is the rational response to the fact that our president doesn’t have any interest in American history? Refusing to accept that this is good or normal is a start but it is totally insufficient. We need to pushback by embracing civic education and elevating the debate with irrefutable reality checks rooted in our history. We can’t wait for distant politicians and increased education budgets to come save us—it’s got to start in conversations at the kitchen table, buying history books, and donating to civic education initiatives. After all, no one would watch the Super Bowl if they didn’t know the rules. History helps combats the arrogance that we are in this alone and entirely self-created. As McCullough reminds us, “We are all part of a larger stream of events, past, present, and future. We are all the beneficiaries of those who went before us—who built the cathedrals, who braved the unknown, who gave of their time and service, and who kept faith in the possibilities of the mind and the human spirit.” We have an obligation to the opportunities that have been given to us. We also need to recognize that we not simply spectators in our own times. We will be held accountable by future generations for the decisions that are made on our watch. The fact that Trump won the presidency by 78,000 votes in three states while losing the popular vote by an unprecedented 2.9 million votes carries enormous throw weight in terms of executive appointments and policy actions. Voting has consequences. But so do the actions we take as citizens between elections. The good news is that the culture of our country didn’t change on election day. And the ongoing story of American history is larger than any one president. Attempts to devalue our history from the right or left, for reasons of power politics or ideological agenda, will fail if we come armed with facts and the unyielding civic commitment to form a more perfect union.